The Nokia Lumia 800 was announced in the wee hours of yesterday morning, but I haven't been able to stop thinking about it. 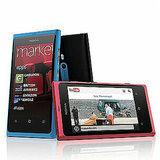 Not only is this device a spitting image of the drool-worthy N9, but this one is US bound in "early 2012" with a rumored price tag of $600 off contract. You've got your preferred Android, BlackBerry, or iPhone device already, so why should you even bother giving this phone a second glance? I've got five reasons for you right here. It's beautiful - Say what you want about colorful phones, but the cyan and magenta tones of this device are pretty stunning. Nokia eliminated any unnecessary ports to keep the sleek polycarbonate shell as smooth as possible. This, of course, means that there is no external SD card support, but with 16GB of onboard storage, it shouldn't be a problem for the average user. Plus, the slightly curved AMOLED 3.7-inch display is crisp, clear, and the perfect size for storing in your clutch or handbag. It's a Windows Phone - The Nokia 800 fits the style and feel of Mango like a glove - the sleek look and brightly colored tiles make these two a match made in heaven. Plus, Mango 7.5 comes with some amazing features - like Kinect and Xbox support, Handsfree, and Threads - that are built right into the software. It's got a great camera - The Lumia 800 comes stocked with an 8MP camera with f/2.2 lens, which stands up to the iPhone 4S, but comes with extra features like manual exposure and white balance, a dual LED flash, red-eye reduction, and Carl Zeiss optics. It can be your navigation device - Nokia is stocking the Lumia 800 with a free voice-powered turn-by-turn navigation system, allowing you to ditch all your other GPS devices and apps. It's a break from the norm - If you're craving something different, I urge you to check out the Mango OS. You might find it counter-intuitive to move from app icons to tiles and threads, but the user experience is quite pleasant once you get used to it. Plus, it's simply beautiful. The live tiles, colors, threads, and fonts all make for a unique device. Adding in the look and feel of the Lumia 800? That's just icing on the cake. What do you think of the new Nokia Lumia 800 Mango phone? Get a look at it in action in the demo video after the break.